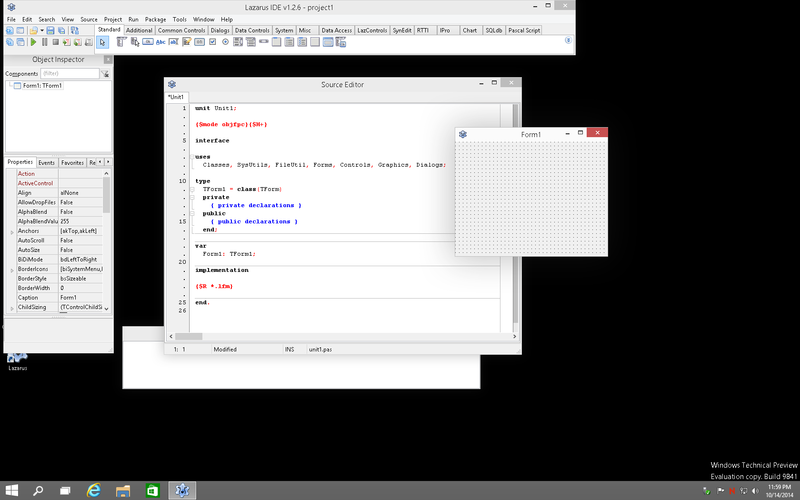 Lazarus is a Delphi compatible, cross-platform IDE for quick application development. It contains various components that are ready for use. These components gibe the user the capability to design and create intricate graphical user interfaces. Lazarus is rich in features, which give the user total freedom to create brilliant applications. One of the most notable features is the ease of use. The installer provides all the required files and does not install any unnecessary files or folders in the system. 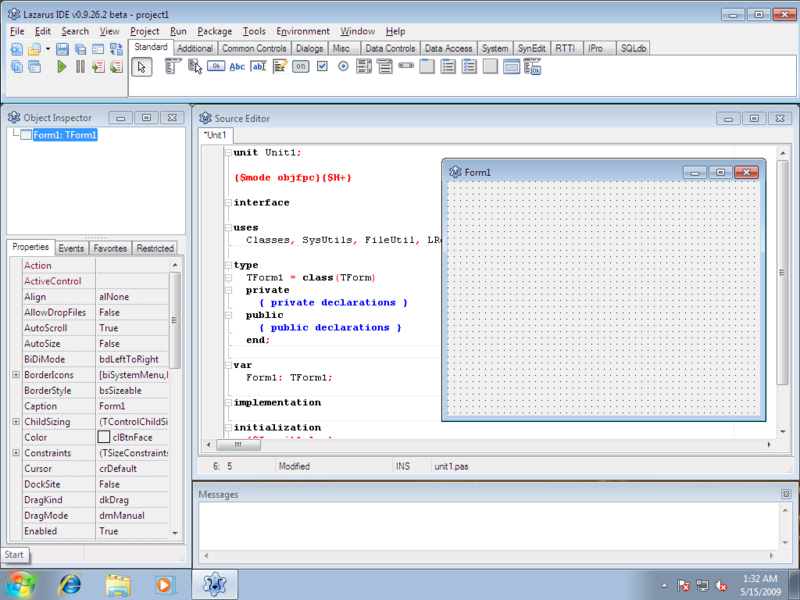 It also automatically synchronizes between code and GUI-Forms. Lazarus seamlessly runs on MacOS, Windows, Linux and other platforms. This feature allows developers run their applications and simulate an experience similar to that of an end-user. The OS specific installation guidelines help save time and resources on the part of the developer. This software is fast and powerful to say the least. 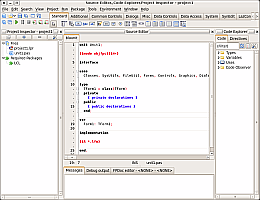 Its IDE has capabilities in handling projects. The FPC compiler is undergoing constant development to refine and optimize performance. 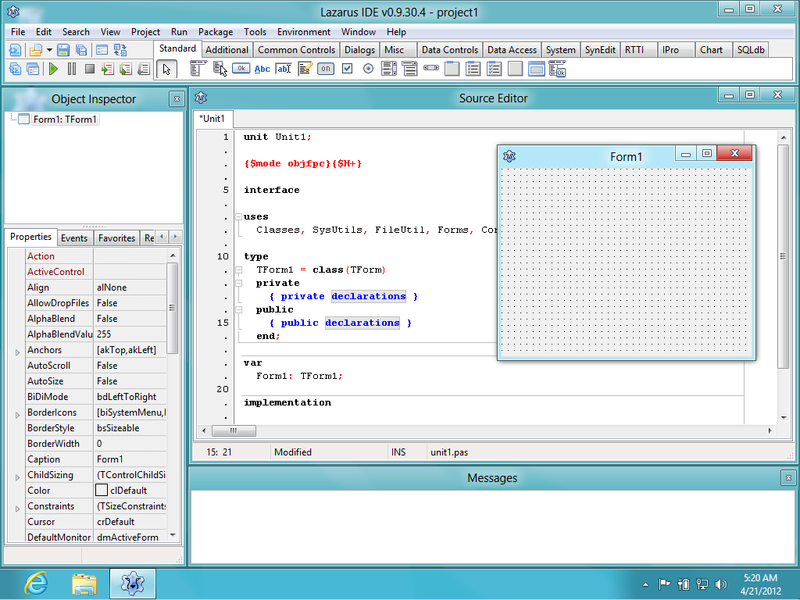 The drag and drop form designer aligns adjacent components and adds them to the IDE by using Lazarus Package Files (LPKs). The Lazarus Component Library (LCL) is used for compatibility usage across all platforms. When users are building their projects, this feature gives them a realistic feel and look of each platform. This enables developers simulate the end-users experience. Lazarus uses Free Pascal, which is a dialect of Object Pascal. The major advantage with this language is its constant development, which integrates new features that keep up with the expected current programming languages. This software is easy to extend. Developers are developing and maintaining their Lazarus Libraries and Packages and it is possible to find any kind of library needed. Lazarus is open source and the main libraries are distributed with extra permission of static linking, under LGPL. All standard components such as LCL, FCL and RTL are suitable for creating both commercial and non-commercial applications. What do you think about Lazarus x32? r56709 Designer: Prevent an AV after deleting a control with csDesignInteractive in ControlStyle. Issue #32813.
r56716 LCL: Remove csDesignInteractive from ControlStyle of TControlBar. Issue #32813.
r57405 LCL: Make popupnotifier dpi-aware. r57483 LCL: Fix keyboard navigation in RadioGroup with disabled items (Issue #33386 patch by Serge Anvarov). Qt5: new widgetset based on Qt5 libraries. Scaled property: the LCL is DPI-aware. Please see High_DPI#High_DPI_in_Lazarus_1.8_and_above for more information. new compiler define LCLRealFormBounds. If you compile your application with LCLRealFormBounds on, the TCustomForm bounds (Width/Height) will be real outer bounds and not client bounds. Also constraints will affect real bounds. For now, it is supported only by win32. new style tbsButtonDrop - paints a drop down arrow on the right side of the button. In contrast to tbsDropDown the button has only single clicking area that invokes the DropDownMenu if assigned. new event OnArrowClick. It is called if Style=tbsDropDown when the user clicks the arrow button area of toolbutton. Breaking change: OnClick was called in 1.6! new DropDownWidth property to setup the width of the toolbutton arrow area for Style=tbsDropDown. The ClipBoard now supports copying and pasting text in HTML format by means of the methods GetAsHtml and SetAsHtml.